I decided my first big project for this blog would be to walk step by step through the Mass. The Mass is full of mind-blowing realities, unfortunately many people view Mass as another obligation they must fulfill to ‘be a good catholic.’ Often when people think of Mass “boring, long, and not pertinent to my life” immediately comes to mind. Hopefully by revealing some awesome hidden secrets of the Mass, it will open your eyes to how magnificent celebrating the Mass is. So one of my favorite parts of the Mass is the Kyrie eleison invocations. This is the part of the Mass where we say “Lord, have mercy. Christ, have mercy. Lord, have mercy.” When we hear this in Mass, it is very easy to repeat back the lines we have all memorized with no feeling or thought. However, I invite you to really think about what it means to ask Christ for mercy. 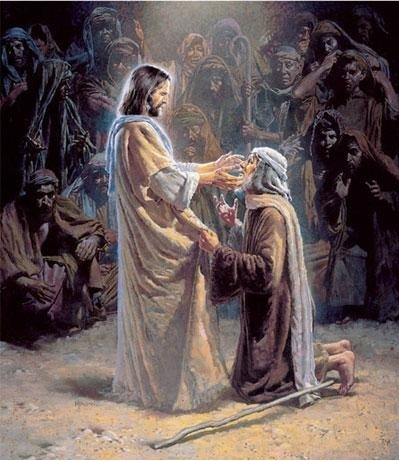 This brings to mind the story of Jesus healing the blind man in Mark 10:46-52. Bartimaeus, a blind man, the son of Timaeus, sat by the roadside begging. We must ask God for mercy in the same desperation and with the same faith as this blind beggar. We are blind in faith and we do not truly see how blessed we are. In our culture there is a dangerous mindset to believe we are entitled to everything. However, before God we do not deserve anything Therefore when Mass opens and you are bored already, ask the all-forgiving God to grant you mercy. We expect our experiences to make us feel good, and when they don’t we don’t want to participate in them. Unfortunately if we have this approach to our sacramental life we will be sorely disappointed. “Before this faith can be exercised, man must have the grace of God to move and assist him; he must have the interior helps of the Holy Spirit, who moves the heart and converts it to God, who opens the eyes of the mind and ‘makes it easy for all to accept and believe the truth” (CC153). To fully participate with faith in the Mass we must first ask for God to help us. “We must beg the Lord to increase our faith” and believe that he will give us the consolation we need (CCC166). We have to make a step toward God and ask for his mercy, we must be conscious of our unworthiness, ready for his healing power, and completely full of faith that he can and will move us if we ask him to. When we begin Mass and say “Christ, have Mercy” become the blind beggar and ask God to open your own eyes to the mysteries he wants to reveal to you.